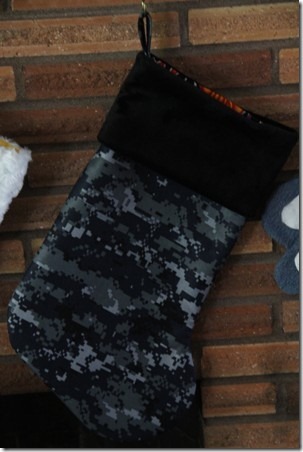 This was our year for new Christmas stockings. Our last set had come under attack by the garage mice, were falling apart and needed to be retired. My first thought, of course, was to make our next ones. I went through a few phases, like planning for each of us to design our own, then I would sew them all. When I sobered up, I scaled the plan back to a more reasonable level. 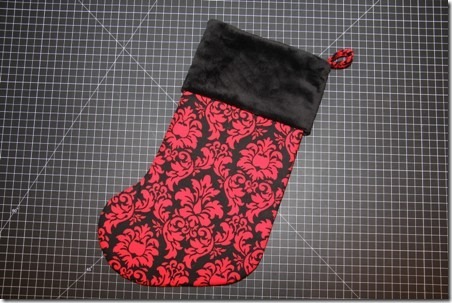 Instead of designing the stocking, each family member would choose a fabric print that reflected their personality. Boy, did we nail it. If you happen to know us in real life, you can probably tell exactly who each of these belongs to. These little babies are fully lined and have a soft, furry Minkee cuff. My daughter made her own, and since she’s still a newbie, that should give you an indication of how easy these are to make. To make one, you’ll need this pattern. You can piece it together, using the lines and letters as guides. Cut two outside socks, two lining socks, two iron-on fleece socks and one hanger from cotton fabric. 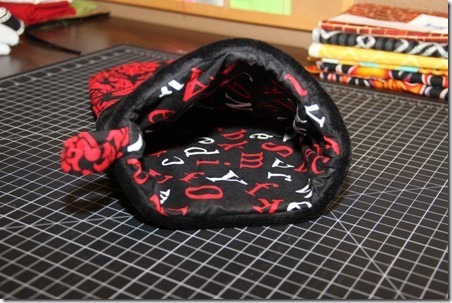 You’ll also need to cut one cuff piece from Minkee folded in half with the pattern on the fold as indicated. 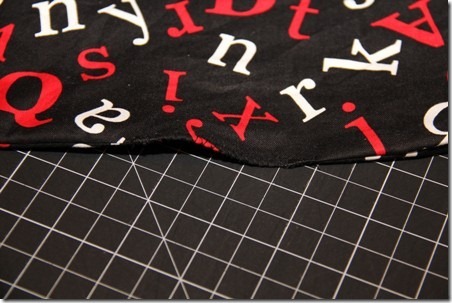 The Minkee can be tricky to work with because it’s slippery, so you may want to go with regular cotton if this is one of your first sewing projects. I would also recommend cutting the Minkee outside, if possible, and shaking well before bringing inside. I cut mine on the back deck, and it looked like I had slaughtered a bunny when I was done. 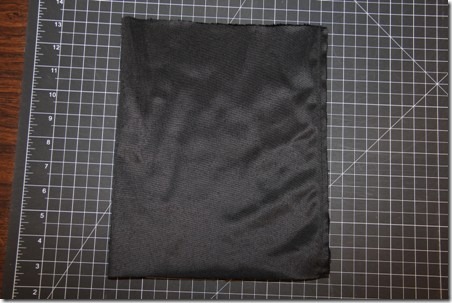 Iron the fleece onto the back of the outside pieces. Pin the outside pieces right sides together and stitch around, leaving the top open. Pin the lining pieces right sides together and stitch around also, but in addition to leaving the top open, leave a 4” opening in the side about midway between the top and heel. Fold the cuff in half with the short sides together with right sides facing each other and stitch across the short end. Turn halfway right side out, so it’s folded with the wrong sides together and the edges are even. Stitch both layers together close to the raw edges to keep it from shifting. Fold the hanger piece in half the with the long sides together and stitch down the long side. Turn right side out and press. I added a piece of webbing to the inside for added strength, mainly because my husband likes to give the kids tools for Christmas and they’re heavy. You might not need it. Turn the outside sock right side out. Slip the cuff over the top so all the raw edges are even at the top. 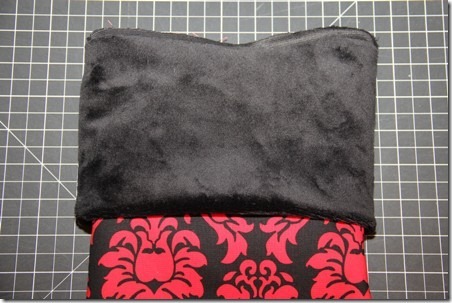 Slide both into the lining, which should still be inside out. Line up seams and edges, making sure everything is even and pin generously. Fold hanger in half and slip between cuff and lining at back seam. Stitch through all layers 1/4” from the edge. Stitch very carefully over the hanger, especially if you added the webbing. I broke a couple of needles trying to sew through that area too fast. Zigzag over the edge for added strength. Turn the entire thing right side out through the opening in the side of the lining. Turn the edges of the opening to the inside and zigzag over the edge to close. Santa isn’t going to care. 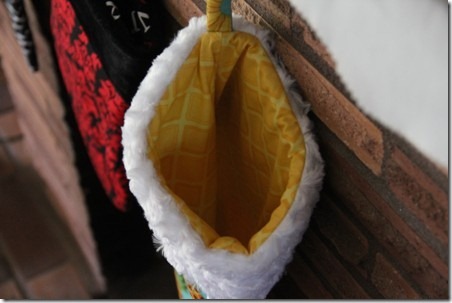 Push the lining into the outside stocking and press. Don’t press the cuff if you used Minkee. Just roll the upper edge toward the inside with your fingers and make sure the lining is pushed all the way to the bottom of the stocking. I love the size of these. Big enough to put some stuff in, but not so cavernous that Santa has to resort to sneaky tactics to fill it. In case you didn’t already guess, this red one is mine. My husband, who loves to build, chose the fabric covered in pipes and I lined it with bricks. Codi went with pineapples, which usually is only topped by Batman, with a bright yellow lining. And Tucker, who thinks camouflage is a color, not a pattern, chose blue digital camo with fire inside. I’m just glad he branched out a little and chose blue instead of green for a change. Not traditional choices, I know, but these make me so much happier than a bunch of ordinary ones would have. Kind of like my little family.